Amigo, aka Diamond Amigos, is a 2½-year-old brindle male born June 16, 2010. His sire is Dodgem By Design and his dam is Miss Dateable. 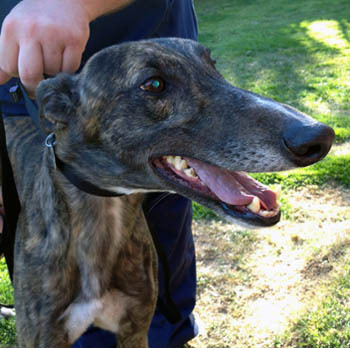 Amigo has 54 races to his credit on Greyhound-data.com. He started at Abilene on October 10, 2011, moved to Palm Beach in December of 2011, and finished up at Southland on January 12, 2013. 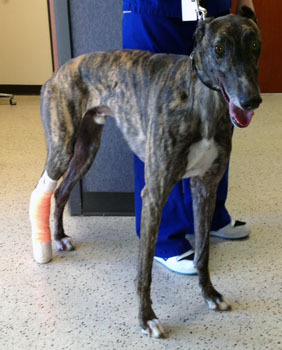 He moved to Gulf Greyhound Park, but broke his leg there on February 25, 2013. Amigo has passed an initial cat test. Surgery was performed by Dr. Bob Radasch of the Dallas Veterinary Surgery Center on Tuesday March 5. Amigo had a right rear grade 4 central tarsal bone fracture. Dr. Radasch reduced the fracture and stabilized it with a 4.0 partially threaded cancellous lag screw from medial to lateral and a 2.7 lag screw placed from cranial to caudal. A bandage and splint were applied, which will be changed weekly for the next 8-10 weeks. Dr. Radasch feels the surgery went well technically, and there is a 50% chance the screws will have to be removed sometime in the future if they cause irritation. Amigo is out of his splint, and has completed the rest of his medical procedures. He is walking well, and Dr. Radasch feels he has made a good recovery.